"The first odd thing we noticed was that some of the quasars' rotation axes were aligned with each other—despite the fact that these quasars are separated by billions of light-years," said Hutsemékers. "A correlation between the orientation of quasars and the structurethey belong to is an important prediction of numerical models of evolution of our Universe. Our data provide the first observational confirmation of this effect, on scales much larger that what had been observed to date for normal galaxies," adds Dominique Sluse of the Argelander-Institut für Astronomie in Bonn, Germany and University of Liège. "The alignments in the new data, on scales even bigger than current predictions from simulations, may be a hint that there is a missing ingredient in our current models of the cosmos," concludes Dominique Sluse. More information: "Alignment of quasar polarizations with large-scale structures", by D. Hutsemékers et al., Astronomy & Astrophysics , 19 November 2014. This is not odd to Plasma Cosmologists, due to their further findings. The filaments are the electric currents feeding these quasars. The large scale structures of the Universe are expected and predicted by Alfven. Astrophysicists don't like when inter- disciplinarians invade their turf, so chances are this will lead to "surprises". Astrophysicists don't like when inter- disciplinarians invade their turf, so chances are this will lead to "surprises"." Or maybe they just treat you the way biologists treat the anti-evolution cranks. May that alfven's name be forevermore, "The Ken Ham of Physics." Hell, cantdrive, I'd even say you are invading alfven's turf, but apparently he likes parrots on his property. The filaments are the electric currents feeding these quasars. A handwave with no substance. How does the electric model explain the emission in quasars, the broad and narrow lines, the polarised lines, the statistics of the variability, the morphology of QSOs... it doesn't. Without a quantitative model of the process you cannot claim you can explain this. The large scale structures of the Universe are expected and predicted by Alfven. Ah yes, I remember Alfven predicting baryon acoustic oscillations validated decades later. No that was big bang cosmology, and BAO even today cannot be explained by these plasma ideas. Or redshift space distortions or the angular correlation function... Plasma cosmology falls far short of modern cosmology. If there's electricity running through the filaments, then there may also be some electric and magnetic fields on the filament. Shouldn't these give a Stark-Zeeman splitting of the emission lines of the intergalactic gas along the filament? So this looks like some effect caused by the coalescence of matter that formed the filaments. Next question, are the alignments all the same rotational sense? Can we tell that from the polarization? Since the fileaments coalesced in directions orthogonal to the filament it sort of makes sense that the main rotational axis should be aligned with the filament. The red/blue shift of the accretion disk should be a general indicator of the rotational sense. I'm not sure whether a rotary component of the polarization is enough, as molecules that the radiation passes through may affect this either way. Yeah, it made sense to me as well (the orthogonal thing). I don't know if the red/blue shift is visible under these circumstances, or if the angular resolution is high enough to see it edge on rather than face on to the accretion disk. I was thinking more of an effect on the polarization, maybe a left/right handed circular component. Even if the disk is somewhat tilted from our POV there should be red/blueshifts. But I'm pretty sure that for most of them we don't have the resolution to get a direct look at the accretion disk. One could posit that there may be correlation between the spin direction of a quasar and the galaxy it's housed in. But I'm not sure how strong such a correlation would be. An easiers step would be to check the galaxies in each filament for rotational preference first and work forward from that. Yeah but it sure would be nice and easy if you could get it as easily as you can the polarization direction they measured (which apparently doesn't find whether the rotation direction is the same or opposite; I'm sure they would have said if they could identify the rotational "north" and "south" poles). I think people are missing a key part. This does not surprise anyone. Why? Because the largest hydro-simulations that could trace such a trend are physically smaller than these scales. None of these simulations could predict it because they're about a factor of 10 smaller. Why are hydrodynamic simulations so important in this connection, and how are they different from the simulations being done now in terms of demand on a system? Ah yes, I remember Alfven predicting baryon acoustic oscillations validated decades later. No that was big bang cosmology, and BAO even today cannot be explained by these plasma ideas. Didn't Alfven die before BAO was even conceptualized? A bit like blaming Einstein for not predicting the digital watch. Accretion disks require hydrodynamics. You don't get disks without pressure and without that you don't get accurate accretion. There are zoom hydro simulations where big boxes are used but only small parts are well resolved but this is a large scale effect. Big hydro simulations that look at black holes well are 100 Mpc, this is 10 times larger. I'm sure it could be done but you would have to go looking for it. Didn't Alfven die before BAO was even conceptualized? BAO started being talked about in the 70's, Alfven died in 95. As I said even now plasma cosmology can't explain it, like most observations. My point was that Alfven said the universe should be filamentary (as did early n-body calculations in the 60's), but is only the very beginning of large scale structure. I would very much blame Einstein's theory if it couldn't describe what it sets out to. I still feel like I'm missing some of your point, I think, IMP. But thanks for telling why hydrodynamic models are used; it makes sense they'd re-use code from those sorts of earlier simulations, and I can see the parallels between the two situations now that you've pointed it out. I'm surprised they need a field as large as 100 megaparsecs to simulate an AGN, though I suppose I shouldn't be. I had heard about simulations of the early universe that replicate the LSS before; I assume they're using a different kind of code to do those, by what you've said. Is that right? They don't. They have thousands of AGN in those simulations, the point I was making was about recreating this trend over a Gpc or so doesn't work because the simulations aren't large enough. Big modern hydro simulations like ILLUSTRIOUS and EAGLE set out to describe the evolution of galaxies from a time not to far after the epoch of recombination when the CMB was emitted. They do reproduce large scale structure but only the smaller stuff, again due to their size. Bigger simulations like Millennium and Q Continoum can do large scale structure on the largest scales but they don't simulate baryons (during the actual run anyway) so they miss the small scale physics. Ahhhh. Yes, that makes it clearer. So are we short of data to validate the simulations, or are we short of processing power to make a realistic one? Sounds like the latter. Another chicken and egg problem: Perhaps it is not that the quasars find themselves aligned within a filament, but that the quasars themselves are the source of the resulting structure. Rather simple when viewed with a bit of logic applied. The quasars are extremely active core stars ejecting massive quantities of new matter largely along the jets, collinear with the spin axes. 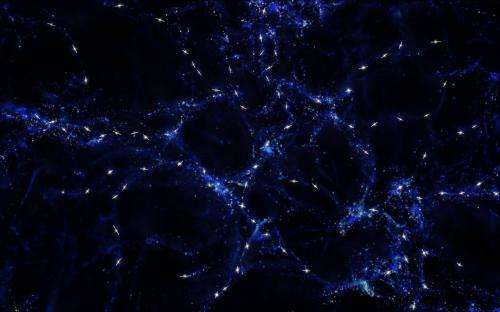 Thus, the new matter eventually forms into other galaxies in the general direction of the axes, forming the larger structure that the quasars 'find' themselves within.